`Abdu'l-Bahá went to a museum near His house. collection of relics of early American civilization. from physical desires and the attainment of everlasting life. Everyone was delighted." leave the house. The lower floor is under you." "Oh I see!" cried the guard, his whole face lighting up. away the dread of death?" passed on. . . . We went there and reflected upon the story & shot videotape. Mahmud wrote: "A number of friends were waiting for `Abdu'l-Bahá when He arrived with a paper from Mírzá Abu'l-Fadl in His hand. He gave it to us and said, `Read it. It is very interesting.' It was an answer to criticisms of one Siyyid `Abdu'lláh, an enemy of the Cause. These criticisms are themselves more proof of the greatness of the Center of the Covenant than are the praises of the friends. Mírzá Abu'l-Fadl has recorded the very words of this critic in his book. And when we reflect upon his [the Master's] work and the work of his father, we find a great difference between the two. The foundation laid down by Bahá'u'lláh did not rise except very little. It was not even apparent to the eyes of outsiders. But what has been built upon it by `Abbás [`Abdu'l-Bahá] since the time of the passing of his father, which does not exceed twenty years, is really striking. We see millions of people of various religions and diverse denominations such as Muslims, Christians, heathens, Buddhists and Hindus drawn and attracted to His Cause from such remote countries as America, Caucasia, Russia, Great Britain and the shore of India. At the table the Master read this paper and smiled. He remarked that according to the words of the Qur'án, the deniers said to the Messenger of God, `Verily, Thou art an insane one.' But now, according to the words of the deniers of the Cause, `vast genius, striking intelligence, consummate opulence, tried virtue' and the majesty of the Center of the Covenant have become a cause for the attraction of hearts. The preeminence and power of the Cause is established even by the words of its enemies. Today the services of Mírzá Abu'l-Fadl were mentioned repeatedly by `Abdu'l-Bahá." Interesting, indeed! Reflecting on the life of the scholar, particularly his role in America and particularly at Green Acre, I find I want to draw closer to him. from Wikipedia: "Near the end of 1912, Abu'l-Fadl started to become ill, and Aqa Muhammad-Taqi Isfahani was able to move Abu'l-Fadl to his house in Cairo, where he remained until his death on 21 January 1914. After his death, `Abdu'l-Bahá gave a eulogy which can be found in Bahá'í Proofs. 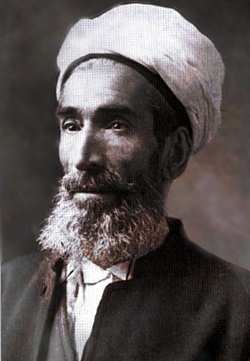 Moojan Momen, a Bahá'í historian, states that Abu'l-Fadl possessed a critical mind, and had a complete devotion to the Bahá'í Faith. Momen states that Abu'l-Fadl's writings "show a keen understanding of modern currents of thought remarkable in a man who only knew oriental languages." and was able to apply the Bahá'í teachings to a wide range of different issues. "Mírzá Abu'l-Fadl wrote on a wide range of Bahá'í subjects, including extensive amounts of material about the proofs of Bahá'u'lláh's mission. He was consistently praised by the central figures of the Bahá'í Faith and Shoghi Effendi. His papers and letters include a wide range of presentations of the Bahá'í Faith for those of Christian and Jewish backgrounds, and his concepts in the presentation of the Bahá'í Faith continue to be important today. After his death, his papers, including several unfinished works, were taken to Ashqabat, where his nephew lived; many of these papers were, however, lost during the Russian Revolution. `Abdu'l-Bahá once wrote, referring to The Brilliant Proof: "His Honour Mírzá Abu'l-Fadl has written a treatise answering the criticisms of a London preacher. Each one of you should have a copy. Read, memorize and reflect upon it. Then, when accusations and criticisms are advanced by those unfavourable to the Cause, you will be well armed."